Good evening. Let’s have a round of applause for our United States Marines and the Navy Maritime Winds Woodwind Quintet. I’d like to thank our many generous sponsors, whose support makes this evening possible. 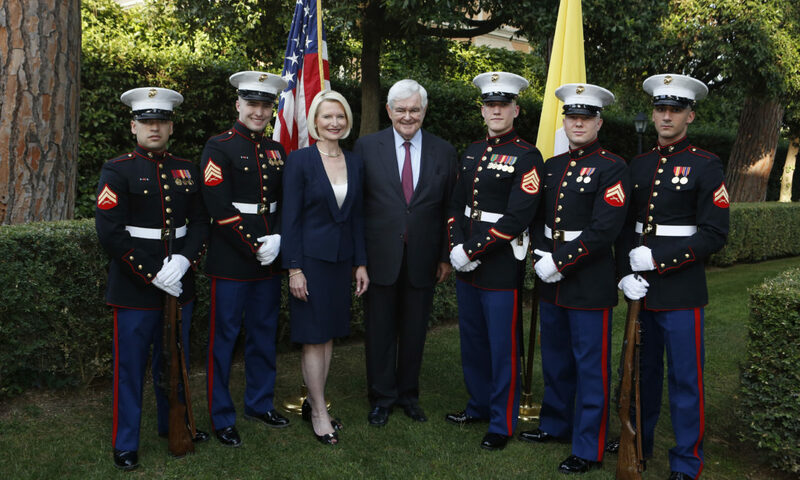 I’d also like to thank my team at the U.S. Embassy to the Holy See for putting this evening’s celebration together. Let’s give them a round of applause! Your Eminences, Your Excellencies, distinguished guests, and friends – Newt and I are so pleased to welcome you to Villa Richardson. Americans come together with family and friends on the 4th of July to commemorate the signing of the Declaration of Independence and to celebrate the birth of our nation. It’s a time to reflect on a unique and remarkable moment in history, when 56 men from 13 colonies gathered in a simple statehouse in Philadelphia and changed the world. With one voice they emerged and declared “that all men are created equal.” They mutually pledged to each other, their lives, their fortunes, and their sacred honor on the belief that government must derive its power from the people. For 242 years, the signing of the Declaration of Independence has been a symbol of liberty, democracy, and justice. The lessons of America’s independence were not meant to be left behind in 1776 – nor confined to the United States. The values and ideals enshrined in America’s constitution have been emulated by democracies around the world. Of course, challenges remain. Today, millions of people around the world suffer under oppression and tyranny – deprived of freedom, security, and prosperity. Faced with these great challenges, the United States and the Holy See share a deep and enduring commitment to advancing freedom and justice around the world. Over the past year we’ve had the good fortune to highlight the many ways in which the United States and the Holy See work together on this noble effort. Last May President Trump and his family visited the Vatican to meet with the Holy Father. President Trump and Pope Francis discussed the shared priorities of the United States and the Holy See on a number of issues, including combatting terrorism and safeguarding human rights. The U.S. Embassy to the Holy See has been hard at work with the Vatican to build on these shared objectives, from fighting human trafficking, to highlighting the work of women religious, to advancing and defending religious freedom. Two weeks ago our embassy held a symposium on defending international religious freedom. Their Eminences Cardinals Parolin, Coutts, and Sandri graciously joined us. This event amplified our joint efforts to defend religious freedom in the lead-up to the “Ministerial to Advance Religious Freedom,” which will be hosted by Secretary Pompeo later this month in Washington D.C. I’m pleased to announce that His Excellency Archbishop Gallagher will travel to Washington for this Ministerial. In April, Archbishop Gallagher also joined us for a symposium illustrating the remarkable contributions women religious make to advance peace and human rights around the world. One of these women, Sister Maria Elena Berini, was honored by the United States as an International Woman of Courage for her service in war-torn communities in Africa. And earlier this year at the Santa Marta Conference we reaffirmed our shared commitment with the Holy See to combatting the global evil of human trafficking. Working together with the Vatican, the United States Embassy to the Holy See will continue to promote peace, freedom, and human dignity around the world. And now, please raise your glass and join me in a toast to the anniversary of our Declaration of Independence, and to the bonds of friendship that unite America and the Holy See. Salute! Thank you. God bless you all. And God bless the United States of America!